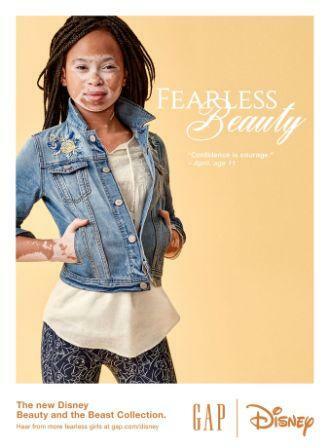 Our theme: "My Spots are Beautiful.."
Fearless Beauty for GAP Kids. 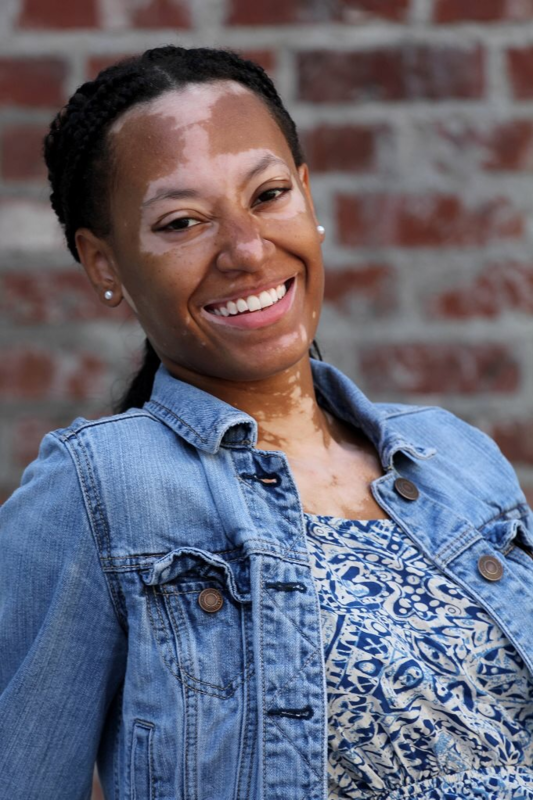 Miss April Star joined us on the U S Capitol Steps, Washington, D.C. in 2016 for World Vitiligo Day and shared her Beauty, Her Story and her SPOTS! 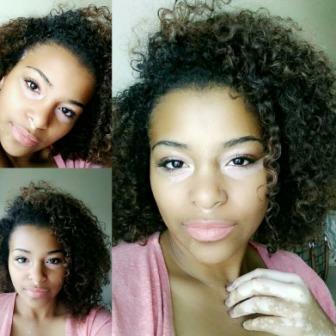 My name is Lenijah and I have had vitiligo since the age of 5. I am 15 now and my life’s journey has been filled with many ups and downs, highs and lows because of my skin, but I have learned to take the bitter and the sweet. My family members have encouraged me along the way, always reminding me to embrace my beauty. I did not always think that I was pretty, but my family nicked named me “So Fly Ny” and as I get older I have come to realize that Vitiligo is not who I am, it is what I have. My grandmother says that beauty is skin deep, that it’s all about who you are inside that shines on the outside. My dream is to be a professional model someday. I think there should be more of us walking the red carpet, showing off our exquisitely different type of beauty, but beautiful nevertheless! My name is Alexus and I am 13 years old. I love to play basketball and I like to hang out with my friends. I was first diagnosed with Vitiligo when I was 9 years old. My family had never heard of vitiligo. I thought nothing of it. I didn't really understand the condition. But as my spots started to spread, I started to understand the condition more. I have tried the light box and the steroid creams. Vitiligo doesn’t bother me at all. People would ask me what vitiligo is and I would feel really uncomfortable telling them because it was new to me. Vitiligo is fine, it doesn’t bother me and I have not experienced any bullying or teasing. I attended WVD 2017 in Detroit, MI. I hope to spread my positivity and confidence by becoming a runway/print model. It’s been my dream to become a model for a while now and I’m hoping to be signed in the next few years. I feel as a model I could really inspire other young people with vitiligo to find that same confidence and know that they’re just as beautiful as the next person. I want them to realize that they’re strong and brilliant and beautiful and they can do anything their heart desires if they put their mind, or their spots, to it. I developed vitiligo when I was 4 years old. The kind I have affects my skin, but also whitens my hair color in the affected areas, like my left eyebrow and some of my hair. When I was 16, I was featured in the Akron Beacon Journal for winning a Silver Key in the 2004 Scholastic Art & Writing Awards. The piece I entered was a self portrait that emphasized my vitiligo. That experience helped shape me and led me towards an artistic career as a 2D and 3D animator. I started freelancing as an animator in 2011 and got my first full-time animation job in 2012 at a company named Dunnamic. I later accepted a job as a 3D designer at Erector Sets Inc, a set design and fabrication company. One of my first major projects there was helping them design the Good Day Philadelphia news set for FOX 29. I currently work at Aardvark Video works, a film and motion graphics studio. Dealing with vitiligo as a child was not as bad as it could have been. I got made fun of from time to time, but my teachers and parents noticed that it actually made me more approachable to my classmates, since they were curious about it. That actually made it easier for me to socialize and make friends. As an adult, I haven't noticed any bad or different treatment. On occasion, a friend, coworker or even a stranger will ask about it, but always respectfully and never in a malicious or cynical way. I've long accepted my vitiligo and embrace it. Viva la vitiligo, and viva la VITFriends! My vitiligo began when I was 8 years of age. I had no idea what was happening to my skin, and as I got a little older others began to call me names which was very cruel. It made me isolate myself and not wanting to go to school or to go outside. My Aunt taught me how to crochet and that for me became a safe haven and I absolutely love to crochet. One day in 2014, I watched a talk show where April Star wanted to meet Winnie Harlow and the story made me very emotional. On that day in 2014, I created the Just-Like-Me-Vit-Doll which was the story about April Star and Winnie Harlow meeting, that was my inspiration. Today, I work in the Health Care field and by night I make dolls. My VIT Dolls are on demand-made to order and are shipped all across America! As I got older, I became more and more comfortable with telling people what Vitiligo is. At school people don't stare at me at all but in public people stare at me all the time. But I'm okay with the staring because I know they are staring at me because I'm beautiful! My name is Kurtis Anthony Nickerson and I am 13 years old. My hobbies are playing on my PS4 and playing basketball. People I know understand my condition so they treat me like a normal kid. At my school they just go with it and I really don't get questioned. Recently, my family and I went to Disney World and at Disney, it was a different story. I got a lot of staring and pointing like they were in disbelief and maybe feared me. It kind of got on my nerves because I'm a normal human, I just look different. I got over it because I realize that this world's views are toxic when it comes to what's on the outside. I want people to see me as a good kid and a role model. I know that not all kids stare at me and that some become attached to me on sight and I'm glad. If and when I make it to the NBA, I want people to see me as a follower of Jesus and a reflection of light in this dark world. Aliya is a beautiful 6 year old girl who was born in Oceanside, CA; she was a preemie at ONLY 1lb 15oz. Aliya loves drawing, singing and playing with her dolls and her baby cousins. Aliya is currently in 1st grade and she is a very good student whose last report card shows ALL A's. Aliya loves school very much and she especially loves math. Aliya is active in Girl Scouts. Aliya's mom first noticed a couple of spots in early 2015 and she was officially diagnosed with Vitiligo in summer 2015. "I have Vitiligo and in the winter you can't see my spots as much. In the summer you can see them a lot more. I have to wear a lot of sunblock so I do not burn my white spots. I'm happy I meet Vitfriends so I know there are more people like me." "My personal testimony on how God can still use you despite of what others have to say about you!" “Look at that cow! Look at that Dalmatian! He’s Ugly! Don’t touch me! Get away from me! He looks nasty! Look at those spots! Stop staring at him!” Learning how to live life with difficulties can be hard and challenging at times. But we cannot let our difficulties hold us down and put us down but make us stronger! While in elementary school a thing happened to me that I thought would have never happen. My life changed tremendously. I was in the fourth grade a normal kid and a spot appeared on my eye. I didn’t quite know what the spot was then it begin to spread on different parts of my body. I felt very ugly and my self-esteem was very low. The spots that were there were called vitiligo. I was scared when this happened to me. I have never seen anyone with is skin disorder it was new to me. I continued to attend school but I was afraid of what people would say about me. I would cover up my body with long sleeves and pants all year around! I even thought about ending my own life because I hurt badly by the cruelty of others. Attending school many of the students were very mean and cruel to me for being the way I was. I would cry every night wishing I was like everyone else again. I use to get called humiliating names, get laughed at by students that was once was my friends, and just treated unfairly for what have happened to me. Teachers would be concerned but just wouldn’t say much. There was times when I played on the playground by myself and cried because I had no friends. I would get stared at all the time by people in public. It wouldn’t be so much of what they said but how they stared at me. But now as the years go by I begin to get comfortable in my own skin. Not caring what people have to say about me because I am God’s creation. My mom would always comfort me when I felt down and alone! She has been here with me through this whole thing. This is still a difficult thing to go through in life. Life hasn’t been easy for me! But we have to push pass how we feel and keep pressing towards the mark. My whole perspective on life changed. I realized that people that were once your friends will not be. I learned that we all are unique and wonderful in our own way. I also learned whatever the circumstances may be we have to be ourselves biggest motivator and encourager. Even with this skin disorder I HAVE DREAMS I MUST ACCOMPLISH. I am not going to let my past be greater than my future. The sky is no longer considered the limit in my book! I can go beyond the sky with my dreams. Being afflicted with vitiligo I no longer consider it a cruse but a blessing from God. I realize that it’s okay to be different from others. Having vitiligo has boosted my confidence and gave others a sense of confidence for themselves. Many people would come up to me and say you’re an inspiration to me. It’s my constant prayer is that I have touched someone’s life and instilled in them a sense of hope. I learned to love myself now! Even though I still struggle with some insecurities, God is working with me to overcome them. Although my life has been full of struggles, the good thing is that all the good in my life has outweighed all the bad and the hurt. I was born and raised in Kansas City, Missouri. I am the oldest of three siblings. I am a graduate of Northeast High School in Kansas City, Missouri and I am currently a freshman at Lincoln University of Missouri in Jefferson City. I serve as the freshman class president at Lincoln. I am pursuing a major in Criminal Justice and Political Science. I am the first in his family to attend college and aim to one day go off to law school and become a prosecuting attorney. As you can music is a BIG part of me. Growing up in the church I realize God has given me gifts, the gift of vocal and instrumental music. I have been singing all my life and playing the piano for most of it too. I have been recognized for his many accomplishments in the areas of academics, law, music, and community. He was recently awarded the President Barack Obama’s Education Award for outstanding academic performance. I was recently awarded a gold medal with the NAACP Act So competition in the category of Contemporary Vocal Music with my rendition of “The Lord’s Prayer”. I am also a member of the renowned Kansas City Boys Choir. I am very active on the campus of Lincoln University. I have engaged in many community service projects and extracurricular activities. I have made the dean’s list my first semester at Lincoln finishing with a 3.2 grade point average. I am active with student government, being a peer student advisor, singing with the Lincoln University Principals of Worship Gospel Choir and Lincoln University Vocal Ensemble. I am truly grateful for God’s faithfulness upon my life. 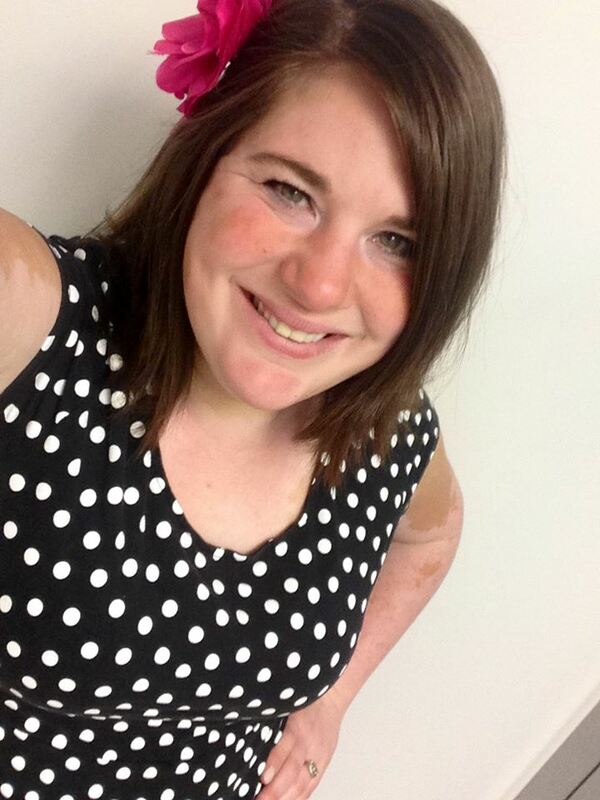 "Vitiligo is 90% Mental and 10% Physical- My Vitiligo Story." And from that moment on, I knew I was going to be okay. I am one of many that decided to take a stand. 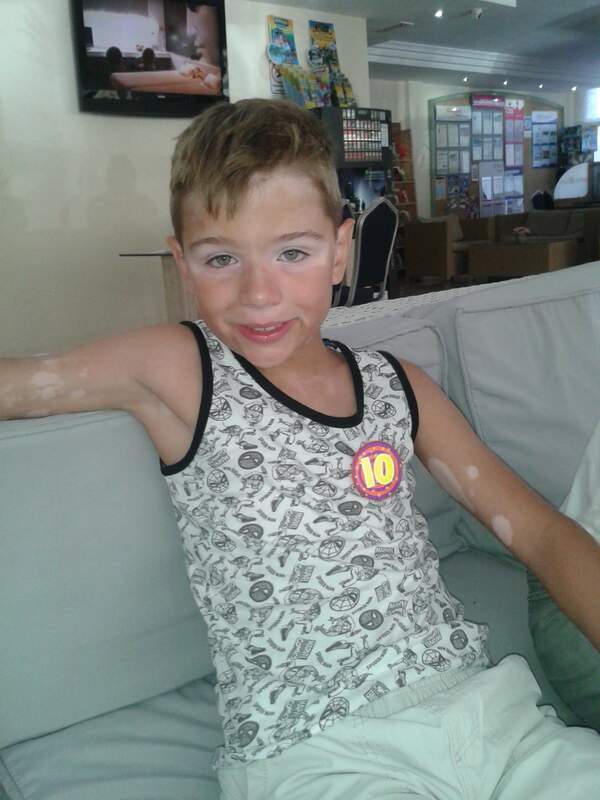 Alfie is a handsome 10 years old boy who has Vitiligo but who does not let Vitiligo get in his way. His mom says his idol is Michael Jackson. He is in year 5 in primary school. He loves to play football and supports Aston Villa in the English Premiership. He loves to play with lego and he makes brilliant space ships. My name is Alicia Roufs and I have had vitiligo since I was three months old. I have never known myself without vitiligo. I has shaped who I am, and how I am. I have learned throughout the years, that my beauty is only skin deep. What’s underneath my spotted exterior is what matters most to me and others. I’m not gonna lie and tell you everything was wonderful growing up. Having vitiligo at such a young age was very hard. Kids are very cruel and I was called every name you can imagine. It definitely made me a stronger more outspoken person. I wasn’t going to let a silly little skin disease rule my life. I learned to be the class clown and make jokes. I figured if they could laugh with me, it was stop them from laughing at me. The doctors have linked my vitiligo to my mother developing hypothyroidism before she was pregnant with me. I guess auto immune diseases run in my family. My sister also has hypothyroidism, and I have diabetes on both sides. I have developed Graves Disease which is also an auto immune disease. It’s amazing to me how so much is linked together. I have never used make up or tried any treatment for my vitiligo. I have just used my self confidence to get me though it. I wouldn’t say I have given up hope for a cure, but I think I have come to the realization that trying to cure an auto immune disease isn’t probably going to happen in my lifetime. I am proud that I can sit here and say I have vitiligo. I have no problem educating those around me and informing what I have. I have been truly blessed to have such a supportive and loving family to lean on during tough and unsure times. I have loved meeting fellow vitiligo people via FaceBook and offering advice and a shoulder to lean on. It has given me a much greater purpose. I know that God doesn’t make mistakes. He gave me this disease because he knew I could handle it and help others. I am glad he did. Because really, those who mind don’t matter, and those who matter don’t mind. My name is Cynphani Morris, I am from Okmulgee, Ok but I am now living in Nashville, TN. I have been having vitiligo since I was younger. As I got older it begin to get better but in the last 2 years it has actually began to spread. I really have suffered low self esteem with having this condition because of it becoming worse. I couldnt see the beauty in me. I Honestly thought growing up I was the only person I'm the world with vitiligo. I thought I was beyond ugly because of these outer scars that were visible. Getting stared at in public and looked at like I don't belong made me feel very uncomfortable. But I have so much support from friends and family and my biggest supporter is my mother. She has lifted me up in so many situations. She has pushed me to not be boxed in and don't let me having vitiligo stop me from pursuing my dreams and going after what I want in life and that is exactly what I have been doing. I know now God made no mistakes when he created me. He knew exactly what he was doing. I am, you are, we are spotting beauties and we are all one of kind. We were wonderfully made. I love being different from the world. I love my spots and I love my vitiligo family! Jaeden’s first spot appeared when he was just 18 months old. He was diagnosed with Vitiligo in 2010. He is a strong boy who knows his Vitiligo is beautiful! He is a very positive person who brightens up any ones day with a smile! Jaeden enjoys school, baseball, and gaming! Jaeden embraces his spots at 7 years old and has maintained a very positive outlook! Because Jaeden has had Vitiligo since he can remember, it is all he knows. Family and friends see his dimples, his bright personality, and his kind heart, not the color of his skin! Jaeden has seen Dermatologists and has stated he does not want to go through light treatments. Jaedens Vitiligo is not a problem that we seek to find a solution for, Jaedens Vitiligo is BEAUTIFUL! Each day I see a smile on my sons face, I thank God for sending me a strong willed little man who embraces life. 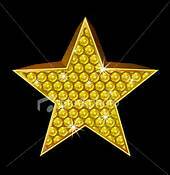 Thank you for considering my son for the Vit STAR! I appreciate the opportunity and the chance for other children who have Vitiligo to see him and know they are not alone! Isaiah 9:6...."For unto us a child is born - unto us a son is given." My Vitiligo started when I was eight years old, I was terrified and worried because I didn't know what was happening. I am now 16 years old, I am very proud of my Vitiligo and over the years taught myself that I am beautiful and I have grown a lot more confident of myself. It has truly made me into the person I am today and has changed my life. Growing up was hard because of the laughs, stares and rudeness but as I got older I just realized that no one should ever have the power to judge you off of something so little. I no longer let the way I look stop me from doing anything. I live a normal life just like anyone else; and I am not ashamed or concerned with my condition. "I love the skin I'm in." I am proud to say that I LOVE MY VITILIGO and I love my Vitiligo family. Is 29 years old and has had vitiligo for 18 years. Jadhira said..."I've tried all treatments even traveled to see many specialist and nothing. I've always accepted my vitiligo, thanks to my community, friends and family who never treated me any different from them." Jadhira states that she is "happily married to my best friend and high school sweet heart and they have 2 beautiful children Jorge jr.11 and Joys O'Neal 8." 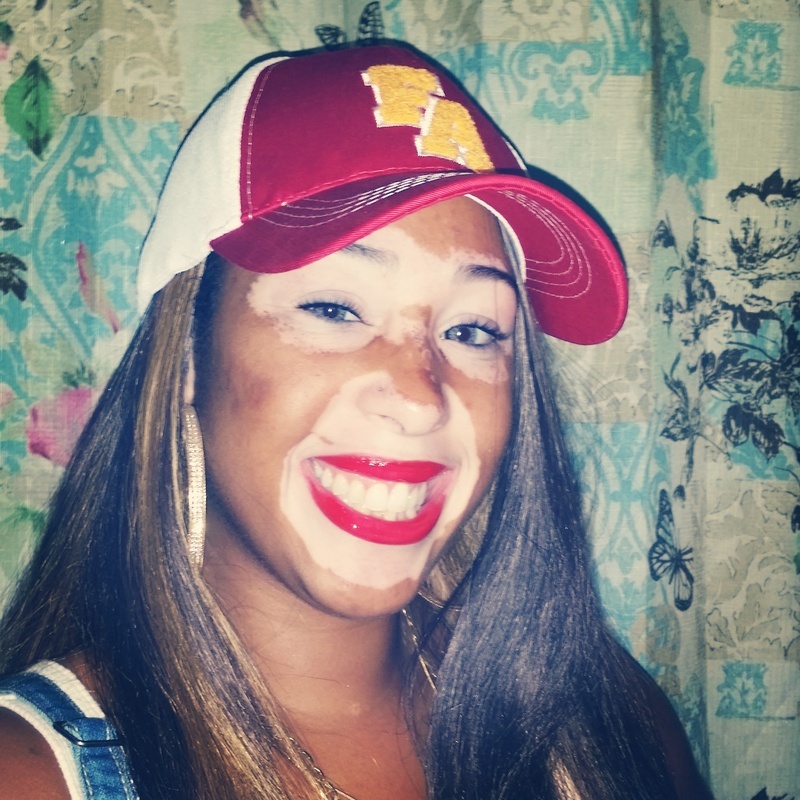 Finally, Jadhira declares that "I love myself and I proudly wear my vitiligo with a smile"
I was diagnosed with vitiligo when I was fifteen years old, but it did not start to spread until my sophomore year of college. My vitiligo is hereditary (my father has it as well) and I truly believe that is what has made it so easy for me to accept and embrace it. My father helped me to adopt a personality that is strong willed, and confident that does not revolve around vanity. In 2010 I started a youtube channel simply expressing my thoughts on vitiligo and it was aimed at people with vitiligo who felt like they were alone. I ended up reaching so many people with my videos, and helping people with all types of skin ailments to learn to accept themselves. something negative neither will those around you. You are unique. You can and will be different. Who wants to be like everyone else anyway ? Your special! I feel special do you?" Claiming It….and Owning It….! Not everyone can do that. Something like this requires a person to be courageous. :Cynthia Harris is a single parent and a Nurse, who is originally from Columbus, Ga, but she moved to the Atlanta metro area about 5 years ago. 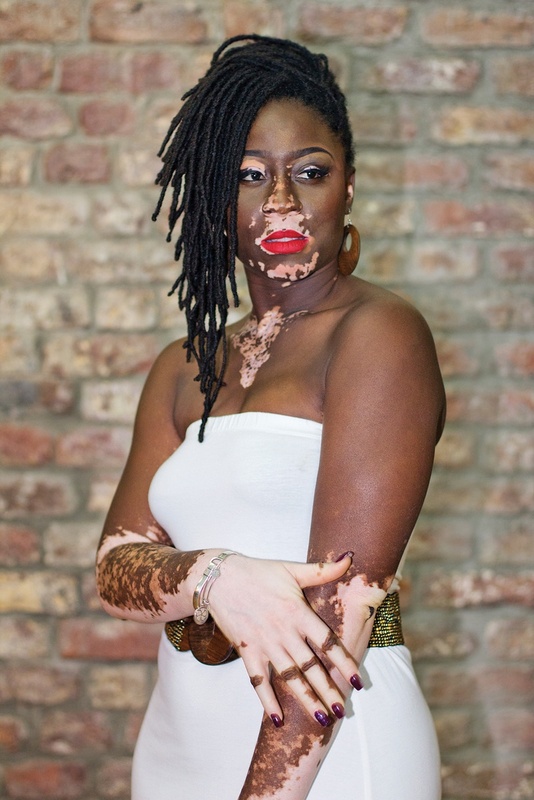 Cynthia was first diagnosed with Vitiligo at age 6. She tell us that she use to worry about what people thought of her and often felt really self conscious and ashamed about her vitiligo. This is what she said about her parents, her main support system...."My parents always told me that I was beautiful and that God doesn't make mistakes." Cynthia tells that she now embraces my vitiligo and loves the skin that she's in. She went on to tell us that...."I am loving the confident woman I have become". Brittany stated that she has done so much research in 11 years, and she has tried to find conferences that she could attend. she just wanted to be around more people like herself, because she knew they understood what she was going through. My name is Nicole Wylie and I am a wife of 7 years to Brandon Wylie and a stay at home mom to three amazing girls ages 5, 3, and 1. I am originally from New Jersey, but today I reside in Georgia. My vitiligo first appeared at the age of 5. I have been told that I wear my Vitiligo like an "accessory,"which by the way I find very funny. I'm very passionate about girls loving the skin they are in and being confident individuals....even with Vitiligo! Jolene Graham Dyer is married and hails from the beautiful island of Jamaica, West Indies. Jolene says..."I think I am a normal girl, working and making jewelry." Jolene was recently featured in a Free Summer Magazine called Pompasette on the island of Barbados. A statement in Pompasette reads.... "We deem it our responsibility to shine some light on extremely beautiful women who would not have been highlighted by traditional standards and media. We want to use our voice to empower." Jolene also told our Vice President, Patricia Rossy that seeing that she has vitiligo, this was quiet a different experience for me even to be asked to be in a magazine; she said...." this was outside my sphere but what is life without some excitement sometimes." Stephanie Corne is a French American artist and a mother who resides in New York City. She has over 20 year of experience in art making, working on Set design, Interior design, and Cable TV. Today she is creating artwork called “Facemotions” which is a collection of portraits with a focus on the representation of someone’s feeling onto the skin.